can eliminate all of your credit card processing fees! Network Payments is proud to offer our merchants, the Cash Discount Program to help eliminate the burden of cost for accepting credit cards. The Cash Discount Program encourages customers to pay with cash or check. If the customer opts to pay via credit card, the credit card terminal will automatically calculate the added service charge into the total for them to pay. As a merchant, you do not need to change any of your pricing, just sign up for the program and we do the rest! Call or email us today for a FREE statement analysis! with checks, credit or debit cards. within the guidelines of Visa, Mastercard, and processor regulations. We’re sure you have other questions, and we have answers – please take a look at our more thorough list below. Is the Cash Discount Program suitable for all businesses? Why would I want to implement the Cash Discount Program? Is this some kind of new program? No, in fact it’s been around for decades in Europe and is used across the US in gas stations where a cash discount is offered at the pump. Gas stations have been using this program in the US for over 15 years. Many national, state and local governments including the DMV, Secretary of State, Post Offices, Schools, Courts, and the IRS implement a Service Fee. What do I need to do to make sure I’m using this program correctly in my business? In order to correctly implement a Cash Discount program, you don’t need to change any of your prices – you simply post signage (that we will provide) that states that all transactions now carry a 4% customer service charge. The proprietary technology is provided by AdvoCharge in conjunction with our hardware and processing partners. ​However any consumer who pays with cash, will have this fee waived. Your posted prices are your cash prices. Consumers who pay with a method other than cash will see a 4% cash discount fee listed on their receipt at the register. The additional 4% service charge is programmed into your terminal, hence there are no additional steps for you. I heard that it’s illegal to charge a fee if someone uses a credit card? Until recently, Visa and MasterCard regulations made it clear merchants could not charge more to a consumer who used a credit card over other methods of payment. As a result of a 2013 lawsuit against the card networks, merchants are now allowed to impose a surcharge in all but 10 states and Puerto Rico. We’ll address the surcharge in the next question below. However, there has always been a stipulation in the Visa and Mastercard regs that allow for a discount when paying with cash. While this may seem like an issue of semantics, It’s simply adhering to the wording of the Visa and Mastercard regulations that allow the cash discount program to be implemented. A Merchant must not directly or indirectly require any Cardholder to pay a surcharge or any part of any Merchant discount or any contemporaneous finance charge in connection with a Transaction. A Merchant may provide a discount to its customers for cash payments. A Merchant is permitted to charge a fee (such as a bona fide commission, postage, expedited service or convenience fees, and the like) if the fee is imposed on all like transactions regardless of the form of payment used, or as the Corporation has expressly permitted in writing. Remember, your stated price now carries a 4% Service Fee, so when you someone pays with cash, they are receiving a discount off of your stated price, not an increase when they pay with credit or other means of payment. Is this the same thing as a Surcharge? I hear that’s only allowed in certain states. Those states claim that a surcharge is not fair to consumers. We find it somewhat laughable that it’s not fair for consumers to pay for the cost merchants incur to provide goods and services while it’s been perfectly OK for merchants to pay for the rewards programs associated with the credit cards that consumers use. You do realize that right? Every time you see an ad on TV, in print, or hear on the radio that talks up the benefits and rewards associated with a particular credit card, those benefits come in the form of higher Interchange rates that merchants pay to be able to accept those cards. The increase in fees is not borne by the card issuing banks or credit card processors – it’s paid for by you the merchant! In a Cash Discount program, all prices in your store carry a 4% Service Charge. The posted prices are your cash price. Those who pay with cash do not have to pay this fee. This is not a situation where those who pay with a credit card pay more. Is this a semantics argument? We’ll let you decide, but most importantly, Visa, Mastercard, and the courts allow for this distinction. The way around this process is to allow us to automate a Cash Discount Program for you which is different than the Surcharge. In the Cash Discount Program you post signage stating that all consumers will now be paying a 4% Service Fee, however for those paying with cash, the fee will be waived. We will automate your equipment so that this fee is automatically added for those customers using any method of payment other than cash (essentially credit cards). While this may sound very similar to the Surcharge Program, it is distinctly different in that everyone is paying an increased fee, but those who pay with cash receive a discount, whereas with the Surcharge program, you are specifically stating that those paying with credit cards will pay more. Most importantly it is aligned with the rules of Visa and Mastercard. Additionally, you are forbidden by Visa, Mastercard, and the Processor’s rules to profit on a credit card transaction, which could happen if you accidentally charged more than you were being charged by the processor. By utilizing the Cash Discount program, we establish proper pricing for you to ensure you stay within all stated guidelines. Won’t my customers be upset by this fee and want to go elsewhere? While nobody wants to pay additional fees, more and more consumers are starting to realize just how expensive it’s been for merchants to accept credit cards. By charging a 4% fee on a sales transaction, that’s a small price for customers to pay for the goods and services you provide. And (if paying that fee or Implementing the Cash Discount Program) allows you to stay in business and keep your overall costs lower, it’s a small price to pay. In fact, surveys have shown that over 80% of respondents stated they wouldn’t think twice about paying that amount (only $1.00 on a $25.00 transaction) for the convenience of using their credit card rather than carrying cash. And we all know that fewer and fewer of us are carrying cash these days…and everyone loves the rewards associated with their credit cards. Additionally, we’ve all become accustomed to paying $2-4 when we use an ATM and this cash discount fee is actually cheaper than the ATM fee for most transactions. If you explain that the Cash Discount program is a way for you to keep providing quality goods and services without increasing your overall prices, most consumers have indicated they understand and are fine with it. And again, a 4% fee on an individual transaction generally has a very small impact to the consumer, but for you, the merchant, your savings are significant. What if I don’t like the Cash Discount Program after a few days, weeks, or months? IIf for any reason you wish to discontinue the Cash Discount Program, we will immediately change you back to traditional Interchange Pricing. You will still save a lot of money on your credit card fees by utilizing the AdvoCharge low rate program, which saves business owners on average 72% over the fees your previous processor was charging. Why does AdvoCharge offer the Cash Discount Program? Since our inception, AdvoCharge has been an advocate acting in the best interest of our merchants, savings our clients millions of dollars each year. The Cash Discount offering creates a path to save our clients even more money each month. With the addition of this program, we have multiple options for our clients to choose from – you choose the savings plan that best suits your business. Ask us about Hybrid options if you’d like to cover some of the costs while charging your clients some but not all of the fees. What if I have a terminal lease? Terminal leases often have incredibly high rates relative to the underlying piece of equipment you are “renting.” For instance, it’s not uncommon to see a lease on a desktop terminal for $79 per month for 5 years. The retail price of the hardware is often only $300-400 and the cost of that terminal will be $4740 by the time it’s all paid off! So when you know the truth it’s nauseating to make that $79 payment, but if we can save you $300 or maybe even $3000 per month in processing fees, it becomes much easier to stomach. Likely better to continue making the payment and set a calendar event to cancel as soon as possible. What if I am under contract? Similar to the previous FAQ on terminal leasing, sometimes cancellation fees can be insultingly high (side note: AdvoCharge never has a cancellation fee!). But often you can wait a month after switching before the fee catches up with you, and by then you will have saved significantly on the new program. In the long run you will be far better off to switch and start saving as soon as possible. 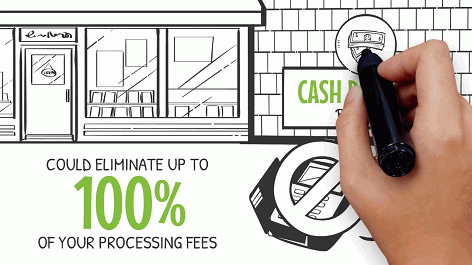 Will a Cash Discount Program totally eliminate my monthly card processing fees? Most merchants will see some small fees on their bill as it’s hard to get every transaction to zero out completely based on all the variances in the Interchange billing structure. That said, we typically see the monthly fees drop down below $100 per month, even if previously the fees had been several hundred or even several thousand dollars! Keep in mind that if you want to receive a statement where the net dollar amount in fees is as close to zero as possible, we will set you up with a daily discount billing plan. That means on a $25 transaction, you collect 4% for a total sale amount of $26. You will receive $25 in your account the following day and the 4% fee will have been subtracted out. At the end of the month, you’ll have the net cost of your goods and services in your bank account with minimal processing fees. If on the other hand, you want to see the total amount of the transaction ($26 in the example above that is inclusive of the 4% service fee), then you’ll see a monthly statement that shows your total sales amount and you’ll be billed for the 4% at the end of the month. If you had 1000 $25 transactions plus a 4% service fee, you’d see $25,000 in sales, plus $1,000 in fees for $26,000 total. You would then be billed for the $1,000 at the end of the month. The net result is the same because you are eliminating your processing costs through the implementation of a 4% fee. It all comes down to how you like to do your accounting – daily with all fees being subtracted out, or as a lump sum subtraction at the end of the month where you’ve put more money in your checking account to offset the end of month fees. The choice is yours. I have a high average sale amount and the 4% might be viewed as being too high for my customers to stomach. Couldn’t I absorb some of that fee and still save at the same time? On a case by case basis, we will work with you to implement a hybrid solution where you charge a Service Fee of anywhere between 1-4% to your consumer and you. Couldn’t the credit card companies not allow a program like this in the future? Yes, while we are currently operating under Visa and Mastercard guidelines, there is nothing preventing them from making changes to their own regulations at some point in the future. The program has been in use in the US for the past 4 years with no indications that either Visa or Mastercard will make changes to prevent it, but it is always a possibility. If the program were to be disallowed, we would simply switch you to our low cost, Interchange Plus program where you’d pay some of the lowest rates possible within the normal card processing framework.